Siomai!!! This is the traditional Chinese dumplings. I came from a country whose dishes have become a fusion of Spanish, Japanese, Americans and the Chinese. We were onced colonized by Spanish, Japanese and Americans and part of our pre-colonization history relates that our ancestors used to trade with our neighbors from China. Some of the Chinese men ended up living in the Philippines since they found their livelihood here. As more Chinese inhabited the Philippines, the Filipinos were influenced and soon embraced some of the Chinese culture, which includes food. It used to be that only Chinese restaurants serve Siomai. But today, the innovative entrepreneurs have extended Siomai as a street food. Siomai can be easily purchased inside shopping malls, train stations, to canteens inside schools. 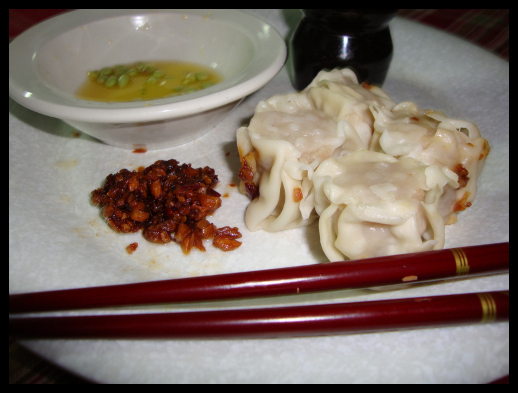 Siomai in the Philippines is usually made of ground pork. Over time, the ingredients of Siomai have been diversified. Instead of the usual ground pork, sellers have used shrimp, ground beef and other types of meat. Siomai here is served in soy sauce with calamansi (unripe/green Calamondin) and chili sauce. Some of you might not like this dish after discovering its ingredients. 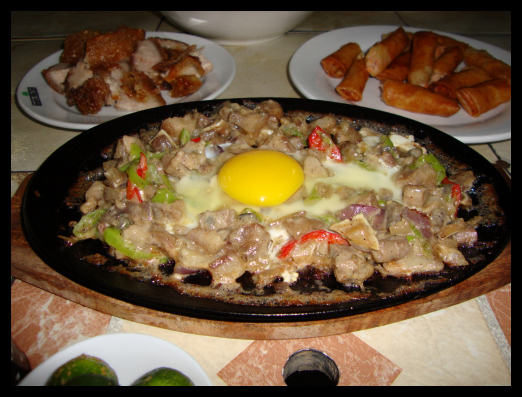 Sisig is a native Filipino food which orginated in Pampanga, a large province in the northern part of the Philippines. Sisig is made from some portions of the pig's head and liver, seasoned with chili peppers, calamansi and sometimes with egg. It is usually served in a sizzling plate topped with fresh egg. Puto Bumbong is made from a particular type of glutinuous rice called Pirurutung, which is distinctively purple in color. The Pirurutung is placed inside small bamboo sticks and are heated using a steamed jacketed kettle. The bamboo sticks are responsible for molding the glutinuous rice in such shape. Puto Bumbong are served and wrapped in banana leaves, which makes everything so Filipino. 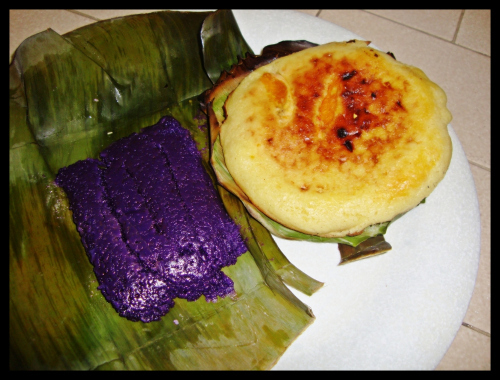 The Bibingka is the typical Filipino rice cake. It is made from rice flour, coconut milk, and eggs. Bibingka is also traditionally cooked. The Bibingka mixture is placed to a clay bowl with lining of banana leaves. The clay bowl is also covered with banana leaves and is baked under preheated coals. This looks like a looong post already ;-) It's 3:01 pm and I still have tons of work to do. I always love your food posts, it's so interesting to get to know other cultures by reading about the food. Those dumplings look yummy! These dishes look wonderful Diane (but I don't know about the pig brain and liver). Very interesting all of the different cultures out there, isn't is? I wouldn't have a clue what to order if I were in your country. Have a great rest of the week, and thanks for sharing all of this. You knew most of us wouldn't like the idea of Sisig but the other two dishes, the Puto bumbong and the Siomai look delicious. They serve something similar here in the States but I'll bet it doesn't taste anything like they way it is served in the Philippines. Thanks for the delicious looking food post! I enjoyed reading about these dishes. They look delicious (and you are right about the Sisig...don't know if I could eat that if I knew what it was). My husband visited the Philippines several years ago for work and enjoyed his visit there. I'll have to ask him if he remembered trying any of these dishes. there is certainly lots of variety in food over in the Philippines! The purple rice looks interesting :) I have eaten the dumplings before, but they are hard to get here in my little town. Usually just in the big cities, as almost all big cities have Chinese restaurants! So glad you posted about food today Diane! That looks YUMMY. We have a really good Filipino restaurant here and although they don't serve Chinese dumplings, I LOVE their food. I love food post as well it all looks so good Diane! Go over and check out some new recipes I posted on today! Thanks for sharing these dishes with us. Hmmm sisig ... hmmm puto bumbong and bibingka!! It's Christmas!!! LOL!! One of the reasons why I miss Pinas ... the food! :) Hope you enjoyed eating them!! Hmmm.....don't think I could do the Sisig, but the other dishes look delish! I'm so glad you spent your Friday outing with a friend. You work so hard that I'm sure that was a much-needed break & sounded very pleasant. Thank you so much for your recent comments on my blog. You are always so sweet!